As I was first scrolling through these photos and thought, “Have I stumbled into a Restoration Hardware store?” Then I read the listing description, which notes the similarity. The house has 4 bedrooms and 3 baths. You can see more photos of the property at Cottage Neighborhood. For more information go to RESTO Homes, which remodeled the house and staged it. Photos by Rockbait Tours. Do you like the Restoration Hardware look? If you could live inside the pages of any home decor catalog, which one would it be? I have to agree. RH overkill. This seems unlivable, not cosy or homey. I want to love it, but can’t. Agreed. Those chairs in the living room make me giggle. The ones with backs so high they cover your head? I keep thinking of Will Smith’s character taking that test in that ridiculous egg chair in Men in Black. This home is unique in its overall decorating style & I have to admit except for a couple of things that I would change I actually like it very much. The colors are natural & very calming & with some personal touches it would be a wonderful home. Restoration Hardware lost me as a fan and customer when they decided to mail out gigantic catalogs. And I don’t mean merely gigantic, I mean ginormous. Such a waste of money and all that publishing and mail cost they incur certainly goes back into the price of the items they sell. RH was good a decade ago, when their product line was diverse, some light things, some larger things. Now, there isn’t a thing I would choose to buy. So, from that, you can presume I do not care for the interior of this home. There’s zero personality. I’m with you! I don’t even know how it’s possible to carry so many products in the same color tone as to warrant such an enormous catalog! PLUS, a separate, equally ginormous baby & child catalog. Crazy. Yep, I laughed so hard while perusing the baby and child catalogue during bathroom reading time. Everyone knows little tykes are so fond of gray everything! I agree! Every once in a while I see something I like, but when I go to that dark showroom I am not impressed with the upholstery or the price. This house looks like those dark showrooms. I also agree with you all. I have been receiving the catalogs for a couple of years now, and while I like some of the looks, I just can’t see myself living in what feels like a constantly foggy rainy world- even the sunlight is greyed out in the catalog photographs. At least this home shows some warm wood tones, though, and many of the rooms do look inviting. So many people complain about the size of the RH catalogs, but there’s only 2 shipments a year, which is much different than the 12+ catalogs per year I receive from Pottery Barn, Crate & Barrel and others. I would guess, it’s actually cheaper to send 2 large catalogs than multiples throughout the year. I’m not a huge fan of the industrial style furniture in this house. But I love the french inspired pieces RH sells. I love the dining room table and wine racks here. I buy a lot of my lighting from the RH Baby store and I love it. And the plush and fur throws are amazing! I actually don’t think it fits the house at all…too Belgian meets industrial for me for a Southern Craftsman. To me, the wood tones are all wrong and it’s too European looking for this style of house. English arts and crafts or mission would look better, I think. Agree. It looks like a photoshoot for a RH catalog. I’m wondering how long the current fad for grayed wood tones will last. Enough to date it to the twenty teens? It seems it would be more in keeping with this style of house to do more natural wood stains versus the grayed/limed/taupe look that RH picked up from the Belgian style. The media room with the Hollywood lights and airplane chairs and ottoman is too much – so gimmicky! I do like the more natural pine pieces in the two bedrooms, though. Overall, I think this look is rather lifeless and depressing. P.S. I do like the dining table and chairs and those orb chandeliers. I agree. The home’s interiors lack any real warmth. I do like wood tones, but this seems dark and gloomy, not warm and inviting. I like Restoration Hardware and I love Craftsman style homes, but I’m not sure that the twain should meet. In my opinion, the master bedroom is the only room in this house that is styled appropriately for a Craftsman. If I could live in any home decor catalog, it would be Pottery Barn. I love the combination of rusticity, comfort and beauty this company offers. Very cool house tour. The look is too dark for me, but I think it’s a neat house. This is very stylish and yes, there’s Restoration Hardware everywhere! 🙂 Do I like it? Yes, I do. Can I live it with that much of RH? No. I think you need to find the right balance between style and trend. Mixing pieces is your best bet. This is a bit too overwhelming to me, but the architecture of this house is stunning. Decor is something VERY personal, therefore, changeable. My favorite thing here? The swings! Oh, aren’t they inviting? Wishing you a great day, Julia. Good Lord – it’s like the Restoration Hardware Fairy threw up all over the house. I love Restoration Hardware but I’m not sure I’d want my entire house looking that way. It’s a beautiful house though – I love Craftsmans and I really like the outdoor space. I too really like Restoration Hardware. In fact, I have their pulls on my kitchen drawers and their light fixtures over my island. But over the past couple years, every time I walk in that store I feel depressed for the people who work there. It’s so dark and moody. I’m a bit of a weirdo too in the way that I don’t want someone walking into my house and saying, you got that from such and such a place. But, I guess that’s inevitable because I shop where everyone else does! Anyway, looks too much like the store and that’s too bad, but great exterior! would have never guessed it was in Texas. I’m with you Patty. I had always been a huge fan of RH and have many, many lamps, mirrors and accessories from there, but when my sister and I walked into a RH in Georgetown, DC after they changed their direction we were shocked at how dreary it was. Not one thing was relate-able to most homes. Everything was hugely over-sized and reminded us of movie props rather than gracious home decor. Very very disappointed, and I see those prop-style pieces in the above photos. Not my cup ‘o tea, I’m afraid. Yes, this describes how I feel about RH. They were much more appealing a few years ago. The house featured in this post is beautiful, but utterly joyless. Fabulous! I especially love the outdoor chandelier! Oh, my! Masculine is right! I think the only thing I really like is that Eiffel Tower. Regarding R.H., I used to love them, but since they went all blah monotone I can’t take it! It’s WAY too much of the same greyed wood tones and white for me. I could live very happily in an Anthropologie or Layla Grace catalog, though. Do online catalogs count? I’ve never actually seen a paper version of L.G. Lots of color, fun and quirkiness is much more my style! Love the house, not too keen on the Restoration Hardware. A little dose here and there would be OK, but this is overwhelming. I like the outdoor space and maybe that’s because it’s done a little more minimally. If I could live in the pages of a design mag? The first one that comes to mind is West Elm. Kim — I want those upholsterers’ cabinets in the Sundance catalog! Wow, I knew I didn’t care for some of the stuff in the RH catalog (I hate how everything is HUGE and I can’t stand those weird chairs), but to me it looks positiviely ridiculous in that house. I can’t fathom why they would think that was the right look for that beautiful house. It just doesn’t work to my eye. I do love the house though. Cheryl — that’s exactly what I said when blogging about RH’s bathroom stuff! It’s cheaper to buy the real deal. My friend, who had an industrial antiques shop in Chicago, used to disparage RH + PB for making knocks offs of what he was trying to sell! I notice you’re in Wisc. If you’ve not stayed at the Iron Horse Hotel in Milwaukee, you MUST go there! It’s a rustic industrial dream, set in a former mattress factory! Dog friendly, too! I just googled it – the place looks glorious. I have a couple of trips to Milwaukee planned for this summer, I will make sure to stop there! Thanks. Cheryl — we spent one night at the Iron Horse with our 2 dogs. We sat outside + enjoyed some foodstuff + brewskis. Everything here is just awesome. Don’t miss a thing — + that includes the rest rooms! Just the other day, I blogged about re-doing our bathroom using everything from Restoration Hardware! Go to their website + look at the bathroom gallery! I get lost for hours, oohing and ahing over their website! However, I will add this: their stores are very dark + depressing now. I loved their old stores so much that my heart sank when I saw their new ode-to-the-dungeon look. I thought they would be out of biz in no time! I guess I was wrong — hope so! Oh, by the way, I love the house! although some are just too masculine for my taste. I love the swings on the front porch. Could those shelves behind the dining table be used for something other than wine bottles? I don’t drink nearly enough wine to have THAT much visible storage space devoted to it. It looks built-in, so that would make me think twice if I were considering buying this home. Reminds me of the way some of the HGTV homes they give away are decorated. So impersonal and staged way over the top. I do not get the impression anyone really lives in this home. Beautiful home…weird staging. I agree with everyone that says too dreary, cold and industrial. Julia, you are right, it does not look like a home, but a RH store. I think they missed the boat on this one. As a librarian, I cringe at what they do to books! I even told that to the sales associate when I was in the store and she just laughed. I think they just went to far with this one. Touches here and there maybe would have been ok. This hose is impressive but also oppressive. Too in-your-face masculine. No fresh flowers anywhere, how sad. I am good at “walking through” a house in my mind, and I get depressed just looking at these pictures. I wanted to take a deep breath and walk out into the sunshine after these pictures. So monochromatic, just like Restoration Hardware. We’ve laughed over their catalogs and how many pages they can print with the same colors on every page. Maybe it cuts down on their printing costs! Even the porch swings: cool to look at but swing on them? No, because they would hit the wall. Literally. It might win in a decorating home show, but to live in it? Nope. Now I’m going to find some fresh air and sunshine. It was really depressing – I completely agree. Also terribly UNimaginative. I think once the furnishings go from that house, it will look much lighter. I used to love RH also, but the furnishings are so depressing now. And the prices have spiked. They used to be more reasonable. Not sure when the industrial came in, I just wish it would fade away. The house looks really cool outside though! I do not like the hooded chairs at all. Life is colorful. This house could use some! Of course, this is just my opinion…..it’s not for me! Depressing, depressing, depressing. The exterior was really promising, but then…. How creepy it would be to wake up in those twin beds with the critters watching your every move. And so much brown. Wow. Could I live in the yard??? I agree! I love it – so warm and cozy to me. Appreciate how they made a total statement with vanishing threshold of garden & home. Treated them as ‘1’. Found this very interesting blog post about the before and after of this home. Fascinating read. 95 comments even, with as many differing opinions as voiced here. That IS interesting. I hadn’t seen that. Thanks!! Wow – that’s some change!! And the contractor is “Resto Homes” I wonder if they partnered with RH for the interior design? Haha….those responses on the other site are hilarious! my favorite is, “it’s faux something or other.” Hahahahaha! This has is a really discussion invoking post! Love it. Those swings on the porch look like so much fun!….. Until you realize how close to the walls they are. You’d either have to be very, very careful (good luck with little kids) or end up frequently repairing dents and marks. Sigh. I left a comment on your FB page, but here I will add that I would want to live in the pages of a Wisteria catalog! It’s alright to buy from these *choke you to death priced stores* but to make your home look like the inside of a cold store. Nah. Not for me. To me…a smart decorator who can take the store products and make them their own or your own is a true decorator or diy’er. The house overall is wonderful but not home. I love Craftsman style homes but do not like this at all. It’s too “staged”, too “RH”, too bland, too dark. I love RH but think it’s important to mix styles. This home will looked dated very quickly. I like the Craftsmen vibe but I don’t like the house for living in. I’d prefer Sundance, Garnet Hill or Ballard Designs. I am not liking this. It’s too dull, needs some color. I used to love Restoration Hardware, and I do like touches of authentic, period industrial style. But RH definitely lost me when they went to all gray and over-sized. Even the wood finishes are gray! BORING. I always like to look at the decorating in the (almost daily) Pottery Barn catalogs, but my favorite things on the pages are usually the props that are not for sale! I do have a PB comfort couch, which I love. p.s. The “Belloqc tea cannisters” look like paint cans. Comments on the house above. As for what catalog I’d like to live in – well, that’s hard because I don’t have one that’s ‘my style’ because I go more for antiques and one-of-a-kind things. I have ordered lamps and lighting fixtures from Pottery Barn and Restoration Hardware. I like the rustic look of Sundance and Pottery Barn for our cabin, a little boho from Anthropologie, a bit of eco from Viva Terra, and some repro looks from Wisteria. But I really wouldn’t describe any of those looks as ‘me.’ I’m happiest scanning the vintage sales on One Kings Lane! 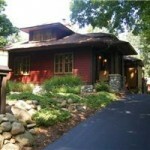 I usually love craftsman homes, but this one has no personality and makes me feel cold just looking at it. I like the house on the outside. But I cannot really get a feel for the house on the inside because it is too dark and too distracting with the large amount of RH stuff. The ‘boys’ room is too cramped, the beds are right up against the walls with no room to walk around them. I sure hope they have more, brighter task lighting in that kitchen, because the ‘mood’ lighting in the photos (with daylight outside no less), is way too dark to cook or even read a recipe by. I think the only things in the house I do like are the shower heads, and the dining room table. I love it! RH is one of my favorite catalogs – I know it’s a monster, but what a dream to look at it. I don’t like animal heads, and I would add a bit of softness to the decor, but I could move right in. I like the greyed, neutrals tones, I’m not one for a “pop of color” everyone wants. I need and crave peaceful and soothing, and this fits the bill. That’s a beautiful home, but in a show home kinda way. Or in a home renovation magazine way. Not in the real, comfortable, homey kinda way. I have a feeling this was a RH sponsored staging. Maybe it’s all going back to zRH after the sale of the house?? It’s interesting from a financial POV they did so much work/raise the roofline to change the style when mid-century modern is in vogue and would cost so much less to flip. Especially given it sounds like, from the link in comments above, it’s now the odd man out in the neighborhood. The thing is it’s clearly not an actual craftsman. Also it’s staged, and looks it, so can’t really imagine living there. Doesn’t seem like it’s the point (you’d hit your head on that light over the bed in the linked pix). However, they sure went all in with the color grey, which I thought was basically over. Paint, everywhere would help with that, but the odd details are what turn me off. The bank of drawers between the sink/dishwasher. The blocked run of counter to the range with the wall oven. And that funky raised kitchen sink! What the heck, looks like they got a sale on a sink and “mickey moused” it to make it fit. I do like the wine rack*, though I’d like to see a window on that side of the house, the lighted mirror/reflective decor/studio lights I’m sure helps detract a bit. Now that I think of it, maybe the dark decor is done intentionally because the house is naturally so dark – not a lot of windows. *I’d have no problem putting this to use, except outside wall in Houston I’m not sure would do any favors for the wine, also part of me secretly wants it for canning jars in a pantry someplace. Maria: Good eye about the bank of drawers between sink and dishwasher. I didn’t see that the first look-through. I have enough trouble putting dishes in when it’s right next to me. Also, great spotting the oddly raised kitchen sink. Imagine the gazzatz that gets caught under the lip of whatever that piece of marble is holding up the sink. I thought the same thing about the sink. Looks like they had to retrofit and added tile around it. Instead of a wine rack, I’d want bookcases! Hi Julia. What a fun post. This house is a nice place to visit, but I wouldn’t want to live there. I do love the FOUR porch swings! If I could live in any decorating catalog, it would be a tie between Pottery Barn and Ballard Designs. As long as we’re dreaming , I’ll take any Charles Faudree book for my weekend home! It’s fun to dream! Thanks for sharing. I’m with a lot of you. I like some pieces, but then it’s just too much. There simply is no personality here. Ya’ gotta shake this place up a little just to make it a tad more interesting. Why are there slats across the bedroom window? I would feel as though I’m in jail. I see lots of things that just look preposterous. The chairs, the gargantuine lights in the media room….the house doesn’t seem ‘real’. Who lives this way? I think the slats belong to the outside fencing. Look at the exterior back porch shot and you’ll see that same design. The camera angle makes it look like the slats are on the window but that room must be right up against the property line. I have just barely survived one of the greyest, dreariest winters on record. Why would I want to live in that depressing environment 24/7? I have to believe that RH “jumped the shark” a few years back. Their stores look like a combination of Aadams Family meets funeral home chic. Seriously…who in their right mind says “You know what I’d love to live in? A factory!” Isn’t that what people retire to get away from? “Jumped the shark” – love it, and agree wholeheartedly. Regarding those porch swings…am I the only person who looked at them and thought “No way can you swing on those when they’re so close to the wall!” They were, along with most of the interior furnishings, for “show” and not for real use. Sad. Hi Julia! Thanks for the feature! My husband actually showed me this house initially and he LOVED IT! I loved a lot of things about the house including the exterior, back yard space, general layout and the kitchen and bathrooms. If I were to purchase this home with everything in it though, I agree with most above, I would remove at least 60% of the stuff in it and mix in more things with color and personality. I am a huge RH fan, but wouldn’t want every ounce of my home dripping with it. I do love the boys room though and that dinning room table. Thanks! I think the house is incredible! And I could move right in. I know that I am in the latter here but there are those of us out here who love Restoration Hardware and YES a house with this much in it. I think it’s great if you are one for color and what one may call cozy but I for one love tone on tone, white along with black and some browns. It’s comforting to me. My home is not by any means filled with pieces from Restoration Hardware such as this home – although I wish it were! – but it does take on the same tone. I have creme colored walls in every single room along with dark wood pieces. I have one couch with a print fabric but it is still in the brown and darker tones. The rich woods against the light walls, carpet and tile is beautiful to me and peaceful. I could never live in a house with color and too much stuff. I’m really surprised that so many are critical of this space. I love it! Thanks so much for sharing Julia. Have a blessed day! If I was buying a house, when it comes to staging -less is definitely more. I would walk away from this talking about the furnishings and not remember a thing about that which I was trying to purchase. As far as living in a catalogue I am more Wisteria than this. the house itself is incredible. great detail, very, very fine materials. well thought out layout. and, while i love restoration hardware & have several pieces of their furniture…i just could not live day-to-day in that so so very staged, so very metrosexual masculine catalogue pretty restoration nation. Another one I’d love to move into. What I like most about this house is the conversation it has inspired here in the comments. I agree with Destiny, a lot of comments! I posted earlier and last night realized what this house reminds me of…..an upscale prison. So gray and industrial, the more I look at it, the more I dislike it. Hope you’ve got a nice, cozy, colorful house next! Living in an RH house would be more of a nightmare than a dream, for me. Interestingly, the house pictured seems more like a movie set than many movie sets, and I think that is why it appeals to some people. The furniture is overpriced for the quality….if a person that that much to drop on a houseful of RH furniture he or she would be better off hiring a good interior designer and getting better quality that is tailored to a personal lifestyle. Im not too sure I like this one at all , they seem to have “too much” of everything, too many swings, too many jugs in the kitchen. I dont know Im not inlove with this one at . I get what they wanted to go after , but not my cup of tea. Not as passionate in my dislike of the style as some of the commenters, but…if this place doesn’t scream “staged” I don’t know what does. Just as if I was a prospective buyer looking at a delinquent or dated interior, I would have to un-see the decor to visualize living there. Such a shame that so much money was spent, and probably is not helping with the goal of selling the property! A little too industrial, and I agree doesn’t look very lived-in, but the house itself does have a nice warm feel to it! I could take a little here and there, but no. This would not work for our reality. I could see a bachelor in NYC having a place like this, but at the same time, can’t imagine many bachelors caring enough to go so over the top in such design. I do like the kids’ room, but just to look at, not to put my kids in! :). It always cracks me up in the catalogs when the room shows maybe one antique toy airplane on a dresser and 3 books in a wall book organizer. I get the staging aspect, but any real kid would hate their parent for giving them such a stale “matchy matchy” room. They spent so much at R H, they only had enough for an Ikea sink in the kitchen! I was so distracted looking at the stuff in the pictures, I lost sight of the fact they are ACTUALLY trying to sell the house. The staging is a big failure in that regard. So much RH it lacked any personality. I can think of a few people that I would LOVE to invite over and place them in the pinched chairs and shine the industrial movie set 10k lights on them- right in the eyes. Ha! I do so love your reader comments. Room and Board or Design Within Reach would be my catalogs of choice, of course! I don’t love everything, but I love a lot! do you know if there’s a floor plan available? Would make a fabulous film set for a demented serial killer. In every room there are items that scream murder.